How to maintain adenium branches? When you begin to maintain the form of Adenium seedlings, you should know how to start in the right direction and good form in the long term. This can help you not waste your time and wrong trial with growing in better form. First thing you must know is the adenium’s characters which present in best seedling form most popular one is “Bonsai Form”. This is the most important thing on Adenium’s maintaining. Growing Adenium-Bonsai Seedlings, the growers who just begin to grow this form will get a big headache, mostly from incomplete form such as less branches, non-spread roots, and bad form on top branches. The worst thing is growing seedlings without concerning parents’ characters. To solve this problem in long term, I would like to suggest 4 main factors focused in growing Adenium-Bonsai’s seedling since the beginning of growing. 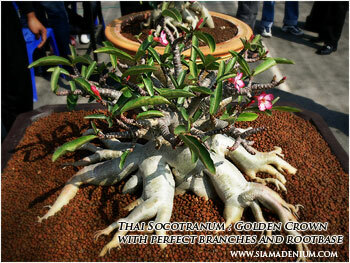 This Adenium-Bonsai form is being the most popular trend not only here but also in global market. doing this and worry when branches start getting longer and longer, sometimes even cutting leaves often. Cutting leaves always do when your adeniums are in ready good shape or Dwarf form. This is what Arabicum growers like to do. Actually, cutting leaves is not my favor in order to control the lengthy branches even in ready Dwarf form. From my experiences, you can get the Dwarf form in sowing only 5-10 percent or good seedling form during baby. What we’re gonna do to control form exactly? 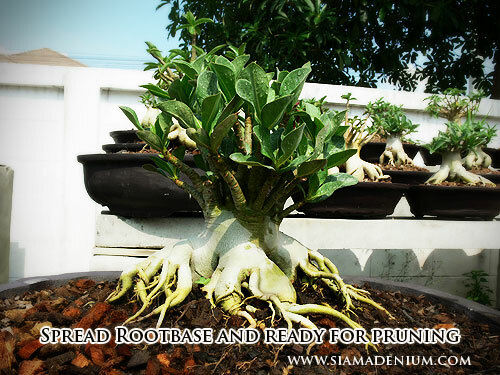 To let leaves growing naturally, not cutting, will better help not only adenium’s caudex bigger but also many more roots especially fibrous roots. This means your adenium will get healthier from photosynthesis with more leaves. You can also feed her with nutrient spraying on her leaves to make her stronger and hard to get disease. Another way out is the hybrid knowledge because some of hybrids or species can give more compact form and many branches. The easy concept is “More internodes, shorter branches”. Arabicum : RCN is the one of specie of Arabicum hybrid comes up with many of internodes but RCN might not perform well in term of spread roots. You should use this specie crossing with Arabicum Lopburi or special form of Arabicum Petch Na Wang perform easily with root base and muscular branch style. I have spent 3 years to find out the best hybrid to make adenium growing nice form without cutting leaves to maintain branch form. 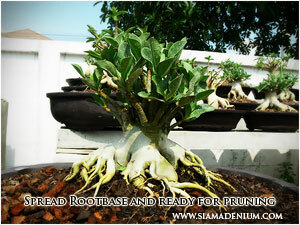 Finally, I found that the mixed hybrid between Arabicum and Thai Socotranum is the most perfect match with better growing naturally in Bonsai Seedling ‘s Shape and easier control the form. Branches are also shorter, symmetric by nature and easier to control, not longer. This is good for adenium beginners with form lovers. 2. Pruning If the branches get longer in this new hybrid, what we’re gonna do? The answer is pruning, not cutting leaves. 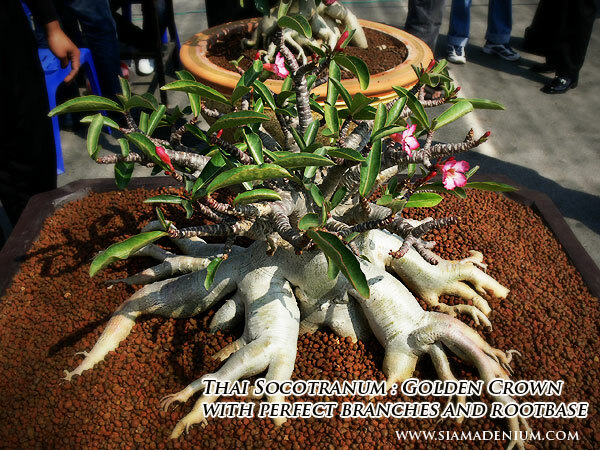 Thai Socotranum is the best hybrid to put out the branches easier after pruning. This is why I do not focus much more on branch form during growing because I can make more branches later but I do firstly focus more on roots since baby seedlings. How to prune Adeniums to get symmetric form? First, you should have the bonsai concept as weapon. 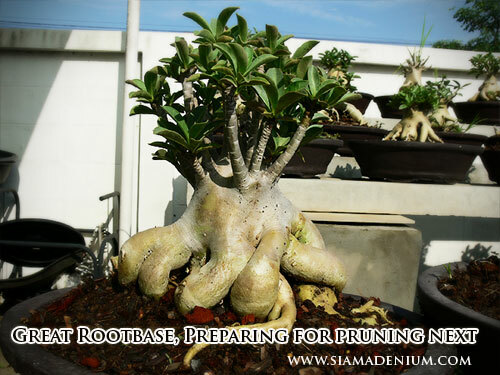 Pruning is the most popular thing found mostly in the group of Thai Socotranum’s players and also wiring to make adenium more beautiful with bonsai form. To make bonsai form in part of top branches, I always prune adenium at least 3-4 times until the branch form is symmetric. 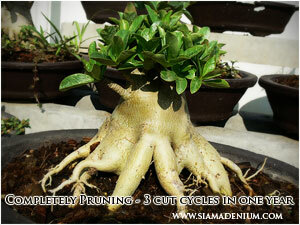 First pruning, you should cut the branches in the shorter position as you decide and wait for new branches come out. You need to concern with the branch direction as well. Second pruning will follow when first branch set is enough bigger and it takes about 2-3 months. Do these again and again until you are satisfy with branch detail and direction. The most important thing of pruning is to cut the branch in the position of internodes because new branch will come out on this position. Please do not forget the concept that I mentioned above, more internodes more branches. (Please see the image below). You can do this in the sunny day or in the rainy season but you need to water her with fungicide chemical e.g. Mathalaxyl after finish pruning. 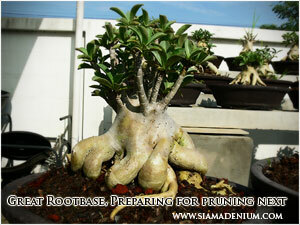 I hope this will help you get more understanding and fun with Adenium growing in bonsai form.